Horseradish (Armoracia rusticana, syn. Cochlearia armoracia) is a perennial plant of the Brassicaceae family, which also includes mustard, wasabi, broccoli, and cabbages. The plant is probably native to southeastern Europe and western Asia, but is popular around the world today. It grows up to 1.5 meters (five feet) tall and is mainly cultivated for its large white, tapered root. 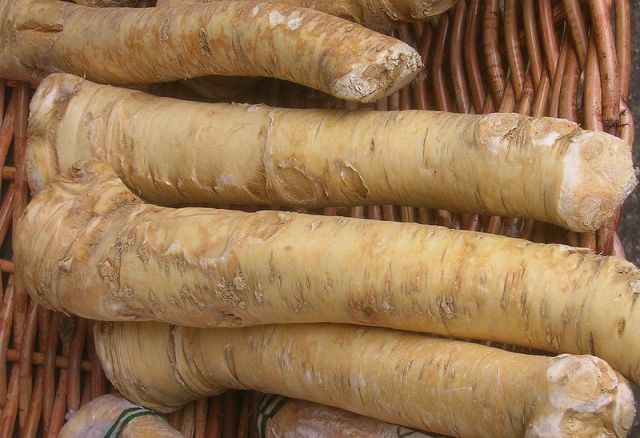 The intact horseradish root has hardly any aroma. When cut or grated, however, enzymes from the damaged plant cells break down sinigrin (a glucosinolate) to produce allyl isothiocyanate (mustard oil), which irritates the sinuses and eyes. Once grated, if not used immediately or mixed in vinegar, the root darkens and loses its pungency and becomes unpleasantly bitter when exposed to air and heat.